Monday was only my second opportunity to see a triathlon up close and personal. I remain somewhat in awe of the event. Just the sheer magnitude of the transition area, the number of athletes and their bikes is amazing to me. The swim start, all of the logistics involved keeping the athletes on schedule and of course safe. Oh, and by the way, there is a footrace at the end. Perhaps a little on the cocky side for a team name, but we were out to have a good time more than anything else and hopefully each of us would throw down a performance in our individual event that we would be proud of. If all three of us did that, no matter who else was racing in the Men’s relay, we would have a great shot at a podium finish (top three). Pre-Race: Due to the size of the event, check-in and racking of the athletes bikes in the transition area occurred on Sunday, one day before the race. There is just no way to get all of that accomplished prior to a 7:00 a.m. race start for the Open Wave of professional triathletes who would be going out in the first group. Ed, Jay and I drove down to the Hyatt Hotel in Austin to pick up our race packets which included the timing chip and strap that we would share for the race, Jay’s silver swim cap, Ed’s bike and helmet numbers and the bib number that I would wear for the run portion. We left the hotel, racked Ed’s bike in the secure transition area where it would sleep for the night alongside 2,000 other bikes belonging to Athletes from all over the state of TX and the rest of the country. Race Morning: Even though I would not be running until close to 9:45 a.m., I wanted to spend the morning with Jay and Ed. So at 5:00 a.m., almost 5 hours before my first strides onto the course, my alarm clock chirped me wide awake. I got a great night sleep for some reason. Not sure if it was the lack of pressure from just having to compete in my own “specialized” event, or if I was just tuckered out from Landry’s birthday weekend, but I slept through the night and felt very rested getting out of bed. I took care of the normal morning activities, packed my cooler with Gatorade, two bagels, water a coke zero for a little caffeine and grabbed my transition bag that held my race flats, a towel to lay on waiting for my event and some odds and ends to change into post-race. I picked up Jay and Ed and at 5:45 a.m. we made our way downtown to get parked and walk over to the race. Body Marking: As we arrived on-site we stopped to get body marked. Our team race number of 100 was drawn on all six of our arms, above our knees and a large “R” placed on our right calf to denote our relay status. Normally our age would be placed on our calves so that competitors coming up behind us on the bike or run course would know if they were racing against us in our age group or not. I would be looking to hunt down some “R”s when it came to the run in a few hours. The Swim: Jay was due to start his wave at 8:00 a.m. Ed and I hung out down at the swim start area until 7:45 when it was time for Jay to get into position. We wished him good luck and headed back up to the transition area for Ed to stretch and get ready for the bike. We were hoping to see Jay at 8:30 a.m. plus or minus a minute or two. 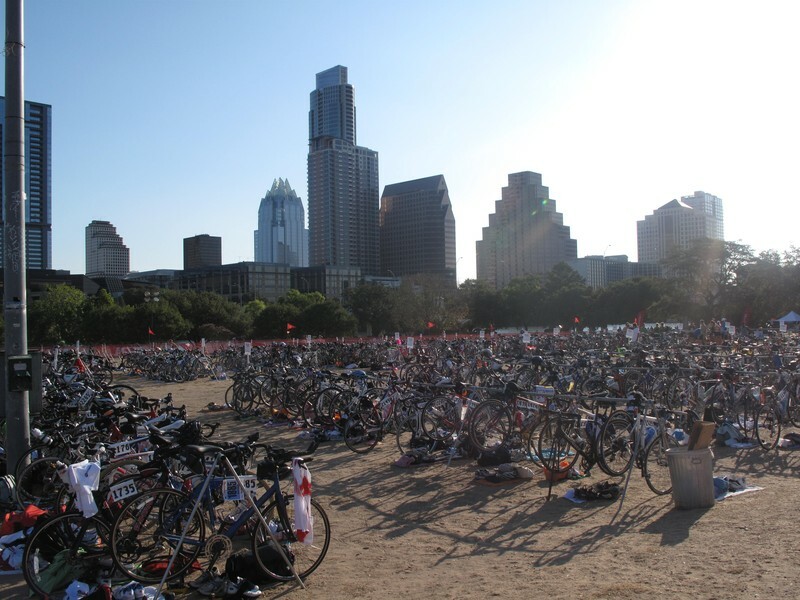 Jay would be swimming 1,500 meters, then exiting Lady Bird Lake and running back up into the transition area where Ed’s bike was racked. I would transfer the timing chip from Jay’s ankle on to Ed’s and he would take off running out onto the bike course. Mount up and be gone. Piece of cake right? At 8:25 or so Ed had completed his warm-up and we started looking for Jay to come barreling down the middle aisle of the transition area. Ed’s spot was on the rack closest to the bike in/bike out gate, which was great. It was however the furthest point from the swim exit, run exit on the opposite end of transition. Easier to run in bare feet (Jay) or race flats (Joe) than in bike shoes (Ed) – so our spot was perfect, but it did mean that after that long swim, Jay had quite a way to run. At 8:27 the first swimmer ran into transition. It wasn’t Jay. I started my clock to see just how much time Ed and I would have to make up on the leaders. Another few swimmers came running into transition. 3,4,5,6 …. There he was. Jay was coming down the aisle. We got Ed’s bike into position and I quickly tore the Velcro strap open off of Jay’s ankle. Strapped the timing chip on to Ed’s left ankle to keep it away from the chain stay and crank of his bike and off Ed went. What Ed and I didn’t know was that Jay’s wave went off 5 minutes late. We were worried for nothing, Jay swim time was 30:46. Our T1 or transition 1 time was 2:06. Marking the moment Jay crossed the timing mat coming out of the water, to when Ed crossed the timing mat entering the bike course. Jay threw down the 12th fastest swim time among the men’s relay teams. The fastest swim was 19:58, by a professional triathlete. We had some folks to catch. The Bike: Ed powered up and out onto the 40 Kilometer bike course. Three loops around 8.26 mile route and Ed would be making his way back to the transition area to hand off the timing chip to me for the run. On a day with calm winds we thought Ed would cover the bike course somewhere in the 1:05:00 to 1:07:00 range. But the winds were anything but calm. A cold front brought cooler temperatures into Austin just in time for the event, but with it, 15-18 mph winds. They would be gaining strength throughout the morning, not great for Jay swimming, but certainly much worse for Ed cycling and for me running. While Ed was off on the bike I started to do some light stretching. I drank a Gatorade, changed into my race flats and went for a short warm-up. As I looked around a lot of the other relay runners were starting their pre-race rituals. Stretches, strides and nervous chatter. I spoke to a couple other runners, but pretty much kept to myself. It was just about go-time and what had been a relaxing morning to that point was starting to get a little more serious. 6.2 miles at race pace loomed for me. I was coming off of a 56 mile run week and a 20 mile long run just last Sunday. I was not tapered properly for the event. Heck, I wasn’t tapered at all with a 14 mile run on Friday and a 9-miler with my sister-in-law Kim on Saturday. I basically took Sunday off and hoped my race legs would show up. To complicate matters, the 10K course was in reality a 5K course that I would circle twice. Because the organizers try to keep the footprint of a triathlon as small as possible for logistical reasons, there would be 24 turns on the course including four separate 180 degree cone turn arounds. Not the type of course that makes for a fast time. Oh, and I also had no idea where the course went, so I would be following the runners up ahead of me. Because the relay was the final wave to go for the Olympic Distance athletes, I would have every single age group in front of me. Dodging traffic would be as critical to a good time as my running well. I ran over to the bathroom right at the 1:05 mark and made a quick return to wait for Ed. After a few minutes we saw Ed dismount and run his way up from the dismount line to the transition area. Ed’s bike time was 1:09:59 – 21.3 mph pace over the 24.8 mile route. In the windy conditions, Ed put down the 3rd fastest bike time. Jay grabbed Ed’s bike, I peeled the timing chip from Ed’s ankle and transferred it onto my own. Because gaining the right tightness for the chip on the run was critical – not too tight to be bothersome, but not too lose to slide around on each stride, I fastened the chip myself. I said a quick goodbye to my teammates and ran out of the transition area. Our T2 (transition 2) time – :53 seconds. Fast. The Run: I came across the timing mat and glanced down at my watch. 5:50 pace. Ouch. Way too fast. I wanted to settle in right around 6:15-6:18 and just stay right there for the race. I knew with all of the traffic and turns it was going to be challenging to run smooth and even. I decided I would lock in on even effort and just let the course fall away from me. Stay even, don’t worry about what mile you are on and how far you have to go and just pass the runner in front of you I told myself. Pass that one, then the next one, then the next one, then the next one – and don’t let a single runner get by you. I set out to run the next 6.2 miles without being passed. Not once. The first mile led the runners out of transition and onto the trail system around auditorium shores. There were no mile markers on the run course which was strange, so the only way I knew when I had reached another milestone on the course was listening for the beeps on my watch. I had my Garmin set to record ½ mile splits. So in 12 beeps I would start my kick to the finish. Pretty easy strategy to follow. I made it to the first of the two turnaround cones on Lee Barton Drive and decided against taking in any fluids at the water stop. There were simply too many runners trying to navigate the turnaround point and it was incredibly congested. I could not take more than 10 or 12 strides unimpeded, which made racing the course like one long game of frogger. I was having to think two or three moves up ahead to see where I could pass best on the left, when on the right and when going in between two runners was the safest and easiest move. It actually made the time go by quickly; when I came back past the circle along Riverside Drive I saw Ed and Jay for the first time. Ed told me that I was now running in 3rd place. I made the left turn onto South 1st street and powered over the bridge I had not run on since mile 5 of the Austin Marathon last February. Running over the bridge at 6:15 pace instead of 6:53 pace felt a whole lot different with the sun beating down on my back. In February the temperature was 20 degrees cooler. I had my Brooks Singlet on and I was just settling into the race. On this day I could feel the sweat starting to run off my shoulders and down my chest settling into the waistband of my race shorts. It was getting hot and I was pushing a lot harder. Same bridge, but it the incline felt a lot steeper this go round. I navigated the turn and started to reel in more runners up ahead. Made the turn back towards the transition area to start my second loop of the course, at least now I knew where I was going. I heard my swim coach Claudia Spooner yell out a “Go Joe!” as I went past and made the turn back into the park. My pace felt smooth and steady and I knew I wasn’t slowing down. It was just a matter of how much time we could make up on the athletes ahead of us. I climbed back up the hill on Lee Barton Drive for the second time and got ready to make the cone turnaround. There was a female athlete on my right, three runner lengths ahead and two to the right. No danger there as I would be able to slide past her then make the turn around. As I approached a volunteer yelled out “Gatorade” and without looking the runner on my right moving at 9:00 min./mile pace made a 90 degree turn right in front of me to try to grab the cup. She would have run straight into me and sent us both toppling over but I quickly was able to push her left shoulder with a straight right arm and hold her off of me while I slid past. My most narrow escape of a fall on any race I have ever run. I made the turn at the cone and decided again to go without water. Just then my good friend Tom who was working the aide station came running out to me and handed me a cup of Gatorade. He apologized for it not being a Bud Light as I had joked with him before the race as to what I would be hoping for at that point in the race and gave him a hearty thank you. I head my watch beep and there were 1.5 miles to go. Another mile and it would be time to push. I made my way back past the circle again and Jay and Ed were there to give me an update. Ed told me we were 4 minutes behind the leader. Not enough miles left to race. I could feel myself deflate a little bit at the news. One and a half miles was just not enough time to make up that amount of a deficit. :30 seconds? :45? Maybe …. But even if I threw down a final mile at 5:55 pace – there was literally no way of catching the leader. I shook my arms out and kept on going at the same effort. I had run well to that point, nothing for any of us to be ashamed of. I know Jay swam his fastest and Ed biked his hardest, I owed it to those guys to keep on pushing. I powered up the South 1st street Bridge for a final time and headed back toward the finish. It gave me a great opportunity to smile and power down toward the finish. I heard my coach one more time yell out for me when I started my kick and I flashed her a quick wink of the eye when I went by. Made the 90 degree turn toward the line and sprinted to the tape. Just :42 seconds off of my 10K PR set last fall at the IBM uptown classic where we will be racing in about a month. Pretty darn solid given the conditions and course. Post-Race: Like Jack’s Generic Triathlon, the post-race area was one big festival. Food, drinks a Beer Garden held by the New Belgium Brewery and a lot of tents for giveaways and training information. We hung out quite a while at the IRunITri booth that my coach sponsored for the athletes. We made our way over to check on the results after they were posted and our team put up a total time of 2:22:37 – 2nd place Male Relay. My run time of 38:50 was the 33rd best time by any athlete in the event – including the Pros – so not too much to be unhappy about there. The most fun for me however was was getting to see Jay and Ed enjoy a podium finish at a major triathlon. They had both worked incredibly hard training and preparing for the event. They were even kind enough to allow a rookie triathlete like me handle their anchor leg, which was quite an honor. Next year we’ll be back at the event, only I will be competing as an individual in the 45-49 Male age group. There will be a lot of training swims, bike miles and run miles between now and then. It’s going to take a lot if we’re going to get back up on that podium. Amazing! Tears! Totally inspired. Way to go. Great race report, Joe. I took part in a HIM relay this past spring, and reading yours brought back memories. I thought it was interesting you were less nervous about the race vs. doing it solo. I was the opposite, feeling more anxious than I usually am when running my own race. Since I didn’t know the other guys on my relay team very well (I was brought on at the last minute) I was worried about letting them down. Even more so when they both crushed their legs. Hi Drew! 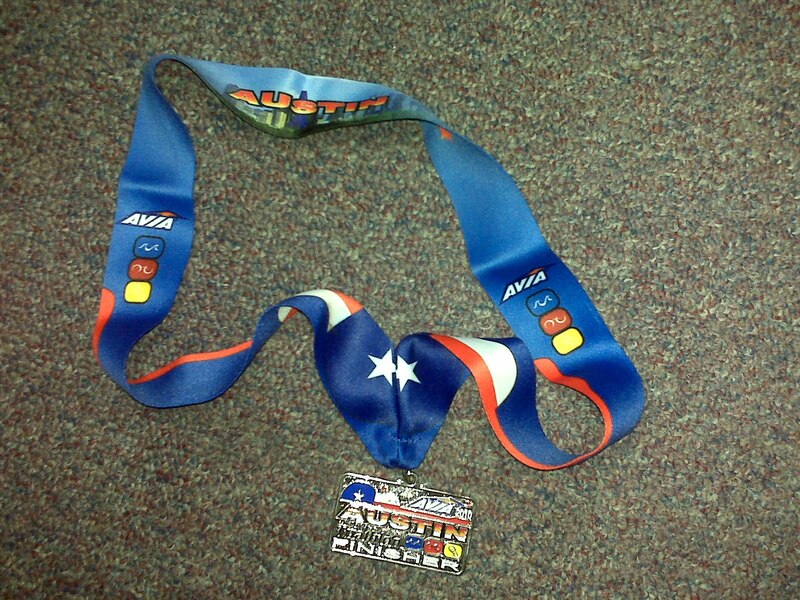 So great to hear from you, had no idea you did a half-ironman relay this year – that sounds like an absolute blast. It was really strange yesterday as I just didn’t get the feeling I was “racing” at all, more like I was a spectator – but once I got that timing chip – it all kicked in quickly. Hope you are great down in Alabama and are getting some good weather – seems like Fall finally arrived this morning to Austin – but I don’t think our summer mornings are 100% behind us just yet.